Hot Jupiters are the most numerous of known exoplanets. These are large Jupiter-sized planets that orbit very close to their parent star. Because these planets have thick atmospheres, they are among the few exoplanets where we can actually study the composition of their atmospheres. This has led to an interesting mystery, where many hot Jupiters are seen to have water vapor in their atmospheres, while others appear bone dry. It now seems that the seemingly dry exoplanets could have water vapor in their atmosphere, but it’s simply hidden by a layer of clouds. The atmospheres of exoplanets are studied by looking at how light from a star gets absorbed as an exoplanet passes in front of it. This means it’s only the upper layer of the atmosphere that we can study. Anything below a layer of clouds or haze won’t be seen. In a new study, a team of astronomers looked at 19 hot-Jupiter exoplanets. Evidence of water vapor was found in 10 of them, while the other 9 showed no evidence of water. They then looked at an overall spectrum of light from these exoplanets, and compared them with models of clear atmospheres and hazy atmospheres. They found that for most of the planets about half the light from their atmosphere is blocked by clouds and haze. 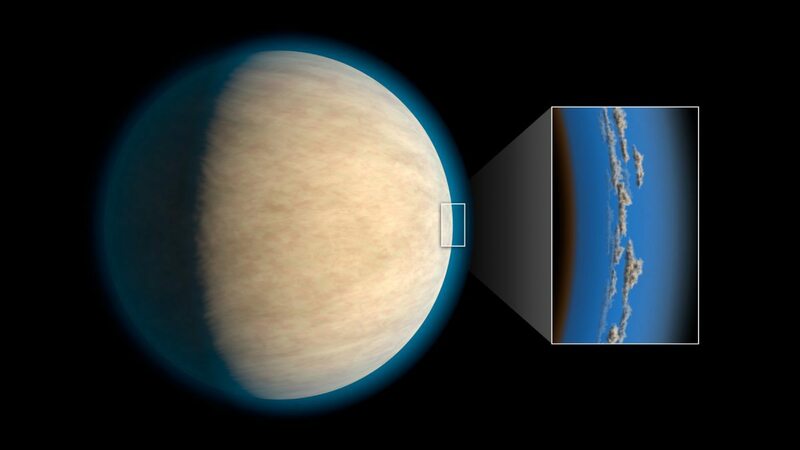 If most hot Jupiters have a cloudy haze layer, then it could explain why some appear so dry. When the bulk of water vapor is below the hazy layer, then it would appear dry. If some water vapor is above the cloud layer, then it would be seen. This doesn’t mean that all dry hot Jupiters have hidden water vapor, but it is consistent with the idea that most hot Jupiters should have water vapor in their atmospheres.